If you’ve ever owned HDMI devices like gaming consoles, HD TVs and streaming devices, you know just how quickly you can use up all your available HDMI ports. These ports can be valuable commodities in an age full of high-definition devices. HDMI switches give you more flexibility by providing more HDMI input ports. Most HDMI switches also provide an easy way to switch between different inputs, along with advanced features such as picture-in-picture functionality and 4K compatibility. With an HDMI switch at your disposal, you get more versatility out of your home entertainment center. Our team has compiled a list of the best HDMI switches so you can make the best decision for your entertainment setup. Don’t forget to read through the associated buying guide and reviews so you can learn as much as possible before making your decision. Read more about our methodology. 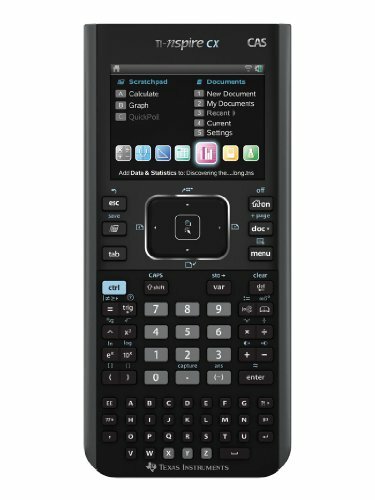 Whether you're a power user or an average consumer, the Kinivo 501BN has you covered. This HDMI switch has plenty of ports and is packed with convenient features, such as both automatic and manual switching, making it our top pick. The Goronya Bi-Directional HDMI switch is compact, portable and incredibly handy for smaller applications. With 4K support and simple one-touch controls for manual switching, this HDMI switch is best used for desktop applications or areas where you can easily access the unit itself. On top of those features, this HDMI switch offers plug-and-play installation for a much easier set up process. The Dinger 3 in 1 HDMI switch is affordable, compact and compatible with top-of-the-line technology. This switch includes a good number of input ports, along with an easy way to manually switch between these input devices. 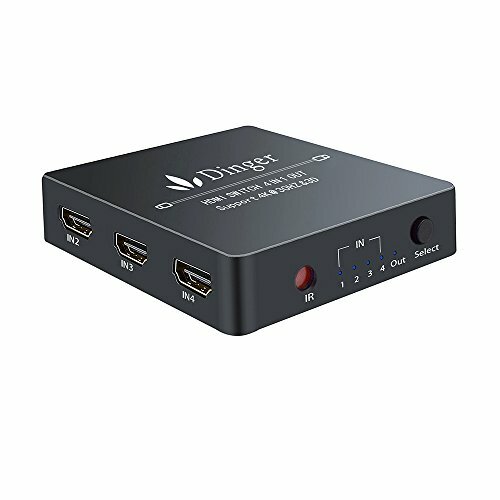 At such an affordable price, the Dinger 3 in 1 HDMI switch makes a great choice for anyone who wants 4K compatibility without paying a ton for it. 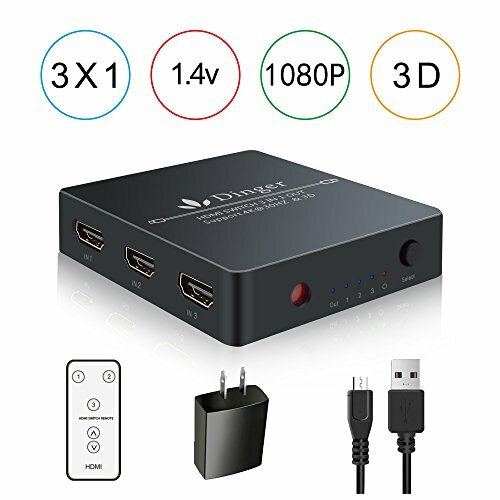 The GANA 3 Port HDMI switch is a unique, affordable option for most consumers. With three incredibly durable input ports that all support 4K and 3D formats, this HDMI switch provides a comprehensive switching solution for a super low price. This switch also features a unique design that includes an HDMI output cable for greater convenience in installation. The AV Access 3x1 HDMI switch offers a variety of different input ports that all support [email protected] devices, along with the latest HDCP version of compliance. With these features and features like surge protection and zero latency input, you can expect to accelerate your gaming setup for a smoother experience. 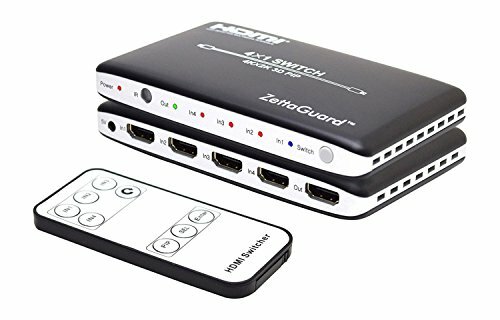 The ZettaGuard 4x1 HDMI switch is a device that can handle up to four input devices at once. With a unique picture-in-picture functionality, you don't have to worry about switching too much between your devices, and you can bet your switch will stay up and running through the periods of heavy use with the inlcuded ventilation. This switch is perfect for power users and average consumers alike. Since HDMI switches are all about providing more flexibility with the number of devices you can have plugged in at any given time, the number of ports available on the HDMI switch you purchase should be one of your top considerations. There isn’t a standard to how many ports a single HDMI switch should offer. Figure out how many ports you need, and then purchase a switch that meets that need. If you’re a power user, consider purchasing a switch that has four or more ports to accommodate all your different devices. HDMI switches typically offer two different ways to switch between the connected devices: manual and automatic. Automatic switching means that whenever you power on a connected device, the HDMI switch will automatically switch the input to that device. Manual switching means that you can switch the input manually, either using a remote or a button on the unit itself. The best HDMI switches provide both switching methods, but you may find that some units will only provide manual switching options. HDCP, or High-bandwidth Digital Content Protection, is a protective measure set in place on media like movies and video games that prevents someone from copying them while they travel between connections. If the devices you’re trying to play media on aren’t HDCP compliant, the media won’t play at all. HDMI switches should provide at least some minimal form of HDCP compliance, but if you’re a gamer who wants to stream or someone who likes to keep up with the latest and greatest, you’ll want to buy an HDMI switch that offers the latest version of HDCP compliance. HDMI switches also offer a myriad of additional features that can vary greatly between manufacturers and devices. Features like IR remotes and picture-in-picture functionality can be huge selling points on HDMI switches. 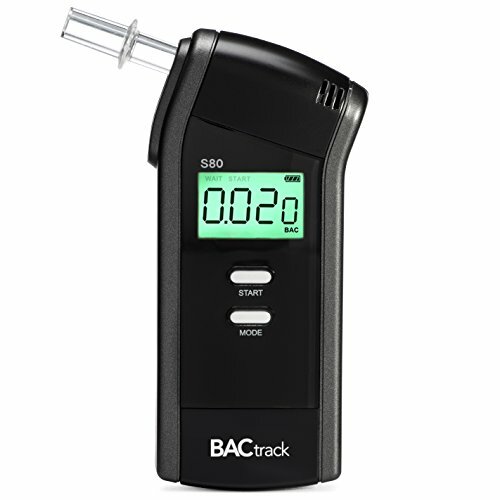 These additional features provide more convenience and can even provide advanced functionality. If these types of things are important to you, consider them on a case-by-case basis. We have indicated these features in our reviews, where applicable. For under $15, you can buy a budget HDMI switch. These HDMI switches are perfect for people who simply need more HDMI input ports for their home entertainment hubs. They typically only offer two to three different additional ports. In the $15-$30 range, you can get an HDMI switch that fits most people’s needs. 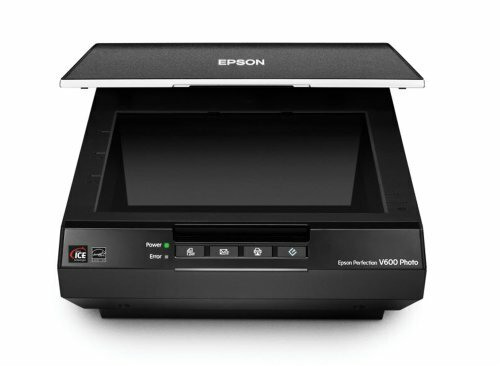 These units typically offer the latest technology, like 4K and 3D compatibility. For more than $30, you can buy a premium HDMI switch. These switches are made for power users who have a lot of devices and want advanced features like picture-in-picture functionality. 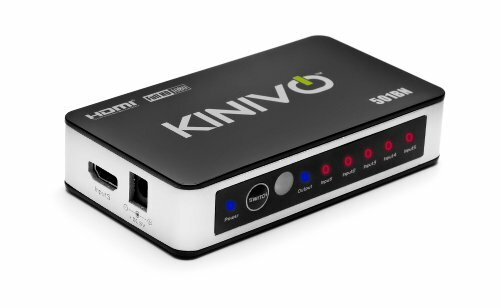 The Kinivo 501BN is an HDMI switch with a ton of available input ports to accommodate all your HDMI devices. With this high number of ports, this HDMI switch works well for power users and average consumers alike, and it also offers a number of features that make it even more convenient. With both automatic and manual switching and an included infrared remote, you can easily switch between all the connected devices without leaving your spot. With these features and more, it’s easy to see why the Kinivo 501BN is ReviewLab’s Top Pick. Tons of input ports. The Kinivo 501BN offers a whopping five input ports for all your HDMI devices. This is on the higher end of the scale, and it beats out the majority of the competition. Many users report enjoying the flexibility they get from the large variety of ports on this HDMI switch. Automatic and manual switching. This HDMI switch provides both automatic and manual switching. This means that as soon as you power on a device connected to the switch, the HDMI switch will automatically flip to that device. However, you can also switch between inputs manually using either the button on the front of the unit or the included remote. 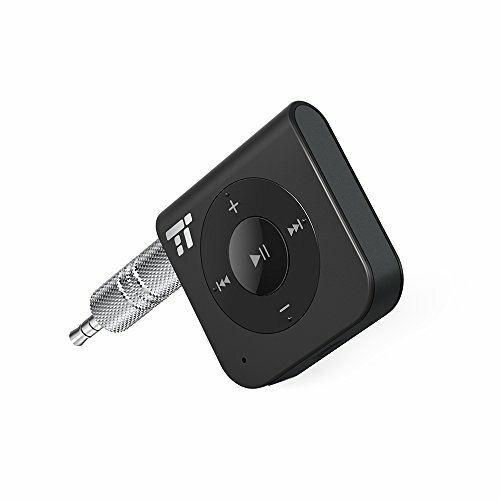 Included IR remote. You can manually switch between different devices plugged into the Kinivo 501BN using the included infrared remote. This compact remote is clearly labeled and incredibly easy to use. Each button is marked with the input number it corresponds to. Many users really like being able to switch between inputs without having to get up from their couch or chair. Helpful display. The front of the unit features a handy line of LED lights that indicate if the unit is powered on and which input is currently active. Many users who purchased the Kinivo 501BN find this display particularly helpful as they switch between the different input devices. Display is bright. Many users report that the LED lights on the front panel are too bright, especially at night. The Goronya Bi-Directional is an HDMI switch that offers two input ports. It provides 4K support on each one of the ports and provides an incredibly simple one-touch control for switching between input devices. With an incredibly compact design, this HDMI switch is portable and best suited for desktop and other smaller applications. These features, including a plug-and-play installation process, make this HDMI switch a great choice for anyone who doesn’t have a ton of devices to plug in. Incredibly small and compact. Measuring in at only 3.3 x 2.5 x 1.2 inches, the Goronya Bi-Directional HDMI switch is one of the most compact and portable switches on our list. Many users purchased this unit for its compact size so they could easily install and access the device without having to worry about it getting in the way of other devices. 4K compatibility. 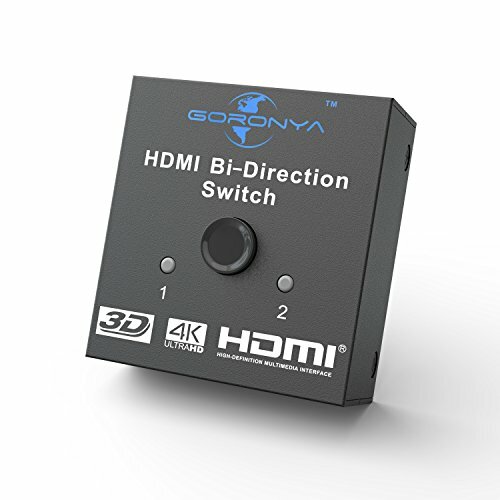 The Goronya Bi-Directional HDMI switch supports 4K input devices at a 30Hz refresh rate. For the most part, this compatibility supports many of the current devices on the market, such as 4K TVs, gaming consoles and laptop computers. Many users are happy that they can get 4K support in such a small package. Easy one-touch control. This HDMI switch offers a simple way of manually switching between the two devices connected to it in the form of a button on top of the unit. This makes it especially useful for desktop applications, where you can easily reach the unit to switch the input. Plug-and-play installation. The plug-and-play installation process for the Goronya Bi-Directional HDMI switch is incredibly easy. Many users greatly appreciate this feature, as it decreases the time they spend setting up the switch and the devices. No automatic switching. This HDMI switch doesn’t offer automatic switching, meaning you’ll have to press the button on the unit every time you want to switch between input devices. The Dinger 3 in 1 is a compact and incredibly affordable HDMI switch that is well-equipped to meet the needs of most consumers. With 4K and 3D compatibility, this HDMI switch is functional with a variety of top-of-the-line devices, including gaming consoles and streaming devices. You can easily switch between the devices plugged into the switch—up to three at a time—using the included remote. This budget option is a good option for anyone looking for an HDMI switch that can handle current technologies. Good number of input ports. With three different input ports, the Dinger 3 in 1 HDMI switch provides a good amount of versatility for easy switching between a variety of different devices. Many users find three ports to be the perfect amount for all their devices, especially at a budget price point. 4K and 3D compatibility. Each of the three input ports supports 4K at 30Hz and 3D setups. Overall, this compatibility gives you the ability to use a variety of devices that you can buy today. 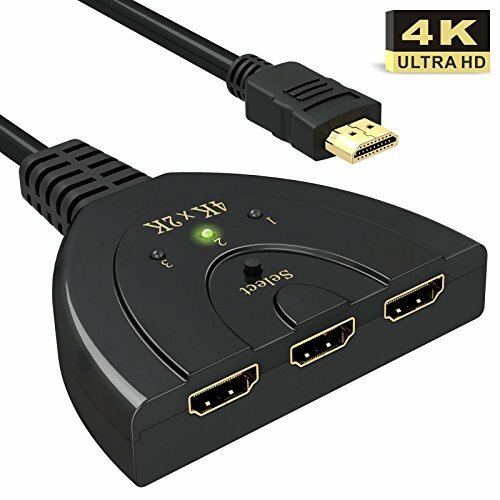 Many users are pleased that they can use this HDMI switch in the highest resolution with their gaming consoles, streaming devices and computers. Included infrared remote. You can manually switch between the different input devices connected to the Dinger 3 in 1 HDMI switch using the included infrared remote. You can also use the button directly on the unit. Users like having both options for easily switching between devices, as it gives them more flexibility overall. Small and compact. The Dinger 3 in 1 is especially compact. This HDMI switch is contained in a tiny box that can fit nearly anywhere. Many users are especially pleased with the unit’s size because they can easily fit it behind a TV or use it in a desktop application. No automatic switching. The Dinger 3 in 1 doesn’t offer automatic switching, meaning it won’t switch on its own to the device you power on. The GANA 3 Port HDMI switch is a unique option that features a pigtail design with a built-in HDMI output cable. This switch offers 4K compatibility, along with incredibly durable port connectors. These features, along with its super affordable price, make this HDMI switch a hard option to pass up for anyone looking for reliability and durability. If you don’t want to spend a lot of money to connect all your devices, look no further than the GANA 3 Port HDMI switch. Unique pigtail design. The GANA 3 Port HDMI switch offers one of the most unique designs of all the HDMI switches on the market. This pigtail design features fixed HDMI cable. This means that you don’t have to purchase an additional HDMI cable to get this switch set up. It also gives you greater flexibility for positioning, according to many users who purchase this HDMI switch. Durable, gold-plated ports. The three HDMI input ports included on this HDMI switch are all plated with 24K gold. This increases their durability and longevity, especially against corrosion. This gold plating also helps with signal transference, ensuring that you get the highest quality picture possible. Supports 4K and other formats. If you have the latest in technology trends, then you likely have a 4K TV, and you may even have a 3D Blu-ray player. The GANA 3 Port HDMI switch supports both of these formats, along with the standard 1080p high-definition format. Many users appreciate the compatibility with a variety of formats, especially since most people have a similar variety in the types of devices they own. Ports are close together. Some users report that the ports included on this HDMI switch are too close together, which may prevent you from using all three of them, especially if you have HDMI cables that are wider than usual. 4K—otherwise known as Ultra High Definition—is the new standard for picture quality in TVs, gaming consoles and other home entertainment systems. If you have any 4K-enabled devices, you should definitely consider buying a 4K HDMI switch. 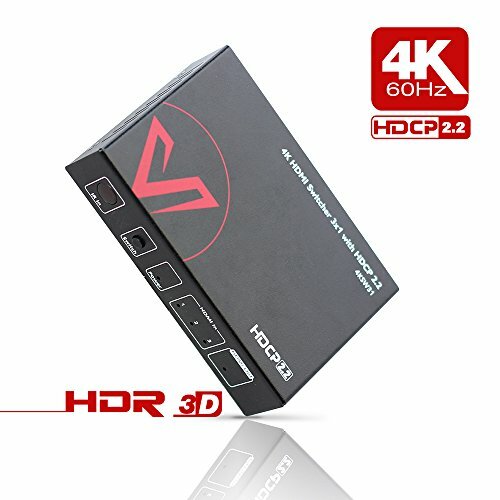 These HDMI switches support various input qualities such as 4K, 1080p and 3D. They typically also offer convenient features like remotes for easy input changing. 4K HDMI switches are great for homes that have the latest and greatest tech. The Dinger 4 Port HDMI switch is an option that provides more ports than most other switches on the market, along with a wide range of format compatibility. With stellar 4K compatibility that offers no latency, this HDMI switch is the perfect choice for people who want a constantly clear picture from each of their input devices. 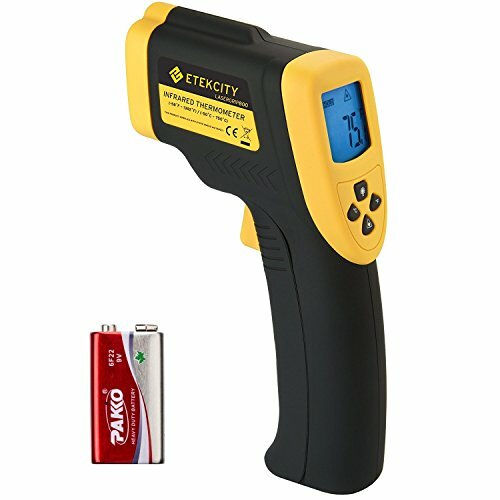 You can also easily switch between your inputs with the included infrared remote, making this an extra-convenient option. 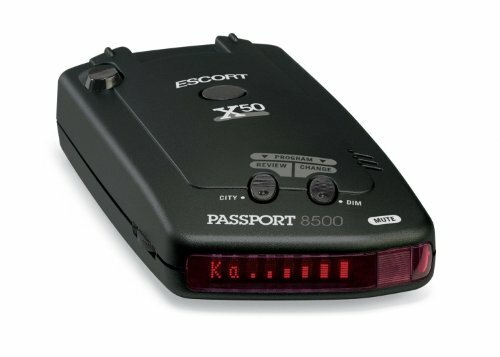 High number of ports. The Dinger 4 Port HDMI switch offers four HDMI input ports, as its name suggests. This is more than the typical HDMI switch offers, and it gives you even greater control over how you use your devices. Many users purchase the switch for the high number of ports alone, especially when they have a high number of devices they want to use simultaneously. Stellar 4K compatibility. This HDMI switch provides compatibility with 4K devices, along with 3D and other, standard formats. This 4K compatibility is especially stellar, according to many users, who report that their 4K picture is crisp and clear. This also means you can use the latest streaming devices and gaming consoles with this HDMI switch. Intuitive manual switching. You can easily and intuitively switch between the different devices plugged into the Dinger 4 Port HDMI switch using the included remote or the button on the unit itself. Users are especially pleased with the added convenience of the remote. Zero latency. The output device that you have connected to this HDMI switch will experience zero lag or latency from the source devices. This means that you get a smooth media experience with no buffering or lagging behind the audio because of the switch. Many users report just this, stating that they’ve experienced zero latency while using this switch. Remote not for large hands. 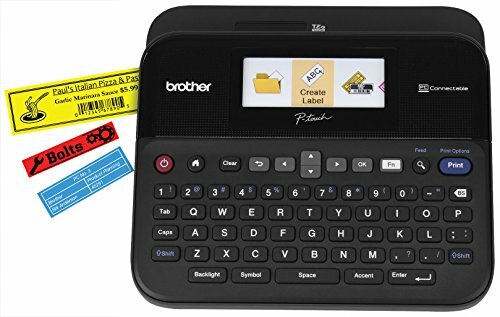 Many users report having some difficulty using the included remote, especially with larger fingers since the buttons are fairly close together. If you’re a gamer, you know just how important it is for all your tech to work seamlessly. You also likely appreciate high picture quality for the best gaming experience. HDMI switches for gaming are made with these considerations in mind. They typically feature 4K compatibility with additional features like support for HDCP if you want to stream your gameplay and high frame rate capabilities. They may also provide advanced features such as surge protection and durable designs. Gaming requires the best of the best, and HDMI switches are top of the line models that work for either simple gameplay or streaming purposes. The AV Access 3x1 HDMI switch is a powerful switch that is perfect for gamers. With the latest HDCP compliance and 4K compatibility, this HDMI switch can help you take your gaming and streaming sessions to the next level. This unit also features built-in surge protection for added longevity and zero latency for instantaneous results. If you’re a gamer with more devices than HDMI ports, look no further than the AV Access 3x1 HDMI switch. HDCP 2.2 compatibility. The AV Access 3x1 HMI switch is compatible with the HDCP 2.2, which is the latest version of high-bandwidth digital content protection. With this compatibility, you can watch and stream the latest content through this switch without having to worry about it being blocked or unplayable. Many gamers who stream on Twitch or YouTube greatly appreciate this feature. [email protected] compatibility. You can watch and game in 4K at the highest refresh rate of 60Hz with this HDMI switch, meaning you can use it with the latest and greatest gaming consoles or PCs. This switch is also compatible with 3D and other standard formats. Built-in surge protection. The AV Access 3x1 HDMI switch provides built-in surge protection so you don’t have to worry about it blowing out in the middle of a gaming session. 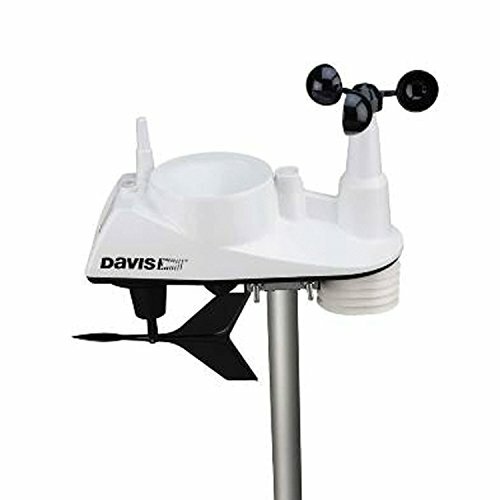 This also makes this one of the most durable models on the market. Many users really like this feature, stating that they feel safe knowing their devices are protected by this switch. Zero latency. If you’re streaming or gaming online, you will enjoy the zero latency that this HDMI switch provides. With zero latency, you’re seeing exactly what your console is outputting at the same time so you don’t have to worry about being a couple seconds behind. No instantaneous switching. Many users report that it takes around two seconds to switch from one input to the other. Power users focus on purchasing tech that is on the cutting edge. If you’re a power user with tons of devices in your home, you might want to consider purchasing a high-performance HDMI switch. These HDMI switches offer all the standard features one should expect from an HDMI switch, but typically also provide advanced features like picture-in-picture support, more input ports and IR remote compatibility. High-performance HDMI switches are the most advanced types on the market, and can help you take your home entertainment set up to the next level. The ZettaGuard 4x1 HDMI switch is made for power users. With four separate input ports, along with advanced functionality such as picture-in-picture capability, this HDMI switch can really pack a punch. It’s also great at preventing overheating due to a unique ventilation system, and can switch between devices automatically or manually, depending on your preference. If you’re looking for a high-performance HDMI switch, you definitely want to consider the ZettaGuard 4x1. Picture-in-picture functionality. The ZettaGuard 4x1 HDMI switch offers a truly unique and incredibly useful function with its picture-in-picture (PIP) feature. The PIP feature allows you to play two separate inputs on a single monitor, with one input smaller than the other. Many users rave about this feature, claiming it to be the best feature of the device overall. High number of available ports. With four separate ports, all [email protected] compatible, this HDMI switch provides enough wiggle room for tons of different devices. Many users are appreciative of this feature because it allows them to create a comprehensive home entertainment center without having to worry about port availability. Unique cooling system. If you’re a high-performance tech user, you know just how hot things can get during extended periods of use, and the ZettaGuard 4x1 is no exception. However, it prevents overheating with a unique set of vents on the side of the unit that allow the device to stay cool, even during periods of heavy use. Automatic and manual switching. You can switch between different inputs either manually or automatically once a new input device is turned on. Many users love the option because they don’t have to leave their comfortable spots just to switch to a new device. Display LEDs are bright. Many users complain about the LED lights on the front of the unit. While helpful in their own way, some users think that they are much too bright.